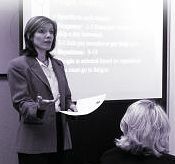 Cathy is known for her energetic and inspirational speaking style. Although she is a content expert on many wellness and fitness topics, everyone knows that great content is not enough! It's the "how" and "why should I" that brings things to life and helps people take health messages to heart! This is where the battles are won or lost and this is where all of Cathy's seminars focus. 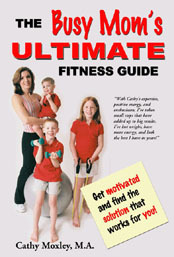 She has been presenting motivational wellness and fitness seminars to large and small audiences since 1992. Former Manager of Health and Wellness for Marriott International, Inc., Cathy specializes in a high energy and often humorous look at the health and fitness struggles many of us share and tips that can be realistically applied to daily life. Does Your Workplace or Business Meeting Need a Pick-Me-Up? Let's face it. Business meetings can get pretty dry and the workload, demanding. Why not try something different? Carve out an hour of your business agenda for a motivational seminar that benefits your employees personally. After all, good health and a good outlook go a long way for the individual... and for the company! How About Your Moms Group or Other Private Group? Maybe your group features a guest speaker every so often. If you have a meeting place and a group of people who want to learn and get motivated to incorporate healthier habits into their lives, we can work together! From Stressed Out to Fired Up! Get ready for Fitness InSight's most popular seminar. You'll never look at food or moving your body the same way! Here is your chance to learn the real secrets to finding fat in food, revving up your metabolism, and reducing body fat. Would you like to make sense of the diet industry's hype and conflicting messages? Which is better: low fat or low carb? Trans fat or saturated fat? Exercising more or eating less? Learn the answers to questions like these plus the five "Dos" and three "Don'ts" to feel full and keep cravings at bay! You'll come away with a new perspective on healthy eating and weight loss and how to strike a balance you can maintain for a lifetime! If Exercise Came in a Pill? Are you really working on what you think you're working on? Dispelling exercise myths. "Sounds good, but how?" What all successful long-term exercisers have in common?and how to get it! Are you barely staying afloat with the demands of work and home? Many of us really want to be healthier, but when you're taking life one deadline at a time, how are you going to fit it in? For many of us, our own health and wellness is at the bottom of the list, after everything else is taken care of. The problem is, of course, that we never get to it and time is marching on! Here's your chance to get motivated and learn practical tips to carve out some time for your own health and wellness. We'll take a look at why it's in your employer's best interest for you to be healthy and cover the top tips in the areas of eating, exercise, stress management, and putting it all together! Custom programs are also available! Cathy Moxley has been presenting a series of health and wellness seminars to our employees on a quarterly basis. She presented her first seminar on July 16, 2003. The feedback and response from our employees towards Cathy and her seminars has been tremendous. Cathy's energy and enthusiasm for the subject matter, her knowledge, and her ability to connect with her audience make Cathy an excellent motivational speaker. With Cathy's help, I believe we are fostering a healthy work culture that ultimately benefits the employee and the business!